Indiana girl. transplanted to India. teaching special education… and living a little too. i’ve covered a number of topics in my 10 blogs thus far, but what i have yet to fully discuss is the “big picture” of what it means to experience India. it’s taken me this long to fully appreciate and gain an understanding of what exactly is going on around me, so i’m making this a series of posts dedicated to various experiences ingrained in daily lives of Indians which can initially be quite shocking coming from a Western society. India is NOT for the faint of heart. don’t get me wrong, i love this place and am very happy with my decision and luck to be able to stay for a while. but i won’t say it’s been easy. for me, the first overwhelming experience was changing planes in the Delhi airport for the first time. as i had booked my international flights separately from my domestic Indian ones, i had to do this switch on my own accord. quick aside: the Delhi airport consists of 3 terminals (one international, two domestic) which one must navigate by ground transportation in the form of a bus or taxi. if someone books a flight straight through with the same airline, the airlines arrange a bus transfer from one terminal to the next so people don’t miss connections. for the rest of us, the pre-paid taxi service is your best bet. as i had put myself into the i-want-to-convince-myself-that-booking-with-an-economy-airline-really-is-cheaper-than-the-connection category, i was on my own. customs and collecting my baggage all went smoothly and i even put on a happy face after falling directly on my bum the first time i tried to pick up and wear my oversized backpack. i found the counter for the prepaid taxis, paid with my freshly exchanged rupees, and walked toward the exit, receipt in hand. through all of this, more and more nervous anxiety for my impending collision with India was building. as I walked through the automatic doors and into this new place, the thing I still remember most clearly was one of the last things i expected to shock me. the heat. i knew India was a hot place and took it as a given, but the wall of thick, blistering air i felt upon leaving the airport was like nothing i’d ever felt before. it was suffocating. i have no idea what the temperature was that day, but it wouldn’t matter anyway because it was simply the kind of heat that can knock you out in one punch. i could feel it weighing my body down as soon as i stepped into it and even the ground beneath my feet (which was shaded) felt hot through my shoe. the objects around me radiated a kind of heat which would normally inform my instincts that i shouldn’t continue touching that thing for too much longer. like that point just before a curling iron is hot enough to burn skin. because of my limited physical experience with this intense level of heat outside of the kitchen, i had to consciously tell my brain that the items were not actually going to instantaneously burn me. getting into the cab to take me from the international to the domestic terminal was not encouraging. the doors and roof of the tiny car were paper-thin and nearly rusted through. the chaotic ride gave me my first glimpse of ground-level India in which i saw, in the middle of a highway, mind you, cows, in addition to lungi-clad construction workers in flip-flops and button-down shirts. all the while, a giant hair dryer blew in on me through every window. a few weeks ago a very kind person from home sent me a nice fresh bag of “Haitian Blue” from noble coffee, along with small filters. when discussing my request for coffee a few weeks ago, i vaguely remember thinking i could probably rig something up to make this all work. this is a brief look into the finagling that NC and i do in our attempts to experience some level of what feels “normal” and/or familiar to us. step one: boil water on the gas stove. i use filtered drinking water but as its being boiled, tap water could work I suppose, but with the hardness of our water i thought it might cause a funny-tasting end result. step two: get a tea strainer, small coffee filter, and a good course-ground coffee. open filter and sit in tea strainer. spoon two heaping tablespoonfuls of coffee (or your usual coffee/cup ratio preference, personally i like strong, rich coffee). 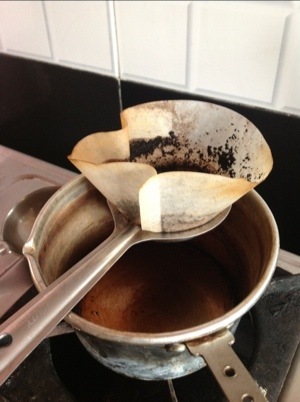 place the prepared strainer over one of two cups soon to hold brewed coffee. step three: when water is at a rolling boil, turn flame down to low just to keep the water hot. especially if using a pathetically thin, heat-conducting tin sauce pan like me and most other Indian house holds seem to use for tea. step four: use ladle to spoon hot water over strainer into glass. step five: repeat step four, rotating between two glasses with each new ladle of water of coffee. this may be especially important for the first few passes through your grounds as they will likely be the strongest. step six: toward the end of the brewing it seems to get more difficult for liquid to filter through the coffee so, as my impatience got the best of me, i stirred/scraped the grounds in the filter. I don’t know if this actually made it go faster but it gave me something to do while waiting for my coffee. step seven: pour in desired amount of milk and enjoy.